« Stuff A Pepper…But With What? Every now and again I go on grocery strike. It usually happens after I open the cupboards and several somethings fall out onto my head. 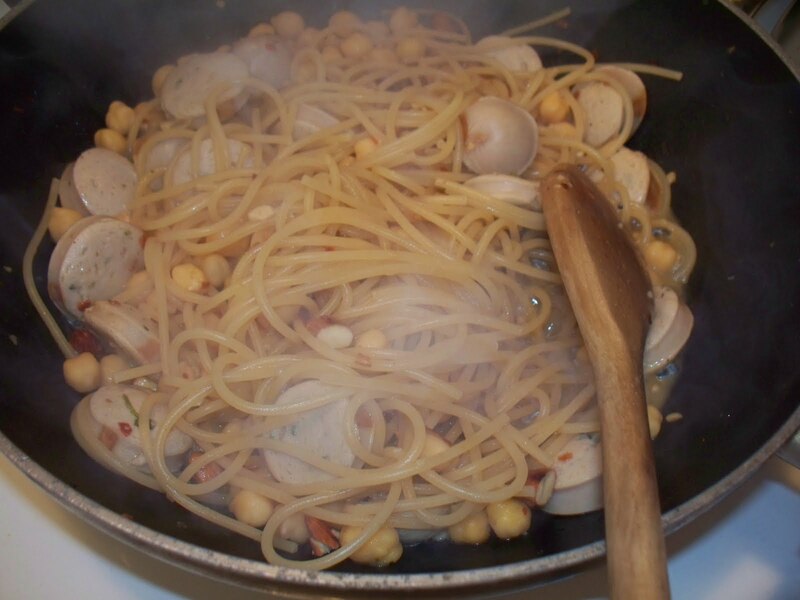 After a flurry of Turret’s, I vow to do some cooking with the items in my pantry and not add anything new until I’ve depleted some of the old stashes.This recipe is one such recipe–created after almonds binged me on the top of my pretty little head. All the items used were ones I had on hand in the pantry (or the freezer in the case of the sausage). Cook the pasta according to package directions. (Note: the servings will vary from brand to brand and type to type, so be sure to read the nutritional facts to determine how much dried pasta you need to cook). When the pasta is al dente, strain and return to the pan. Add 1/4 cup chicken broth and allow the noodles to finish cooking, soaking up the chicken broth. While the pasta cooks, heat a medium-sized skillet with deep sides over medium-high heat. 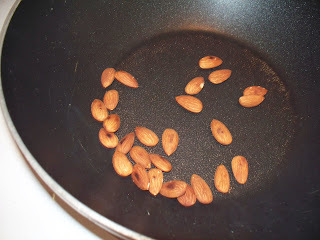 Roast the almonds, stirring or flipping the pan constantly so that they brown but do not burn. Remove from heat and allow to cool. In the same pan, sear the sausages on each side. The sausages are pre-cooked so they just need to be heated and have a little brown added to each side. 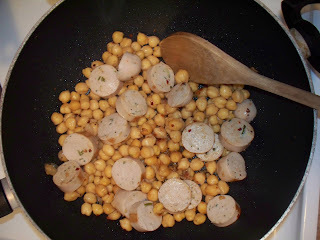 Remove from heat and allow to cool.Turn the heat down to medium and add the canned chickpeas. 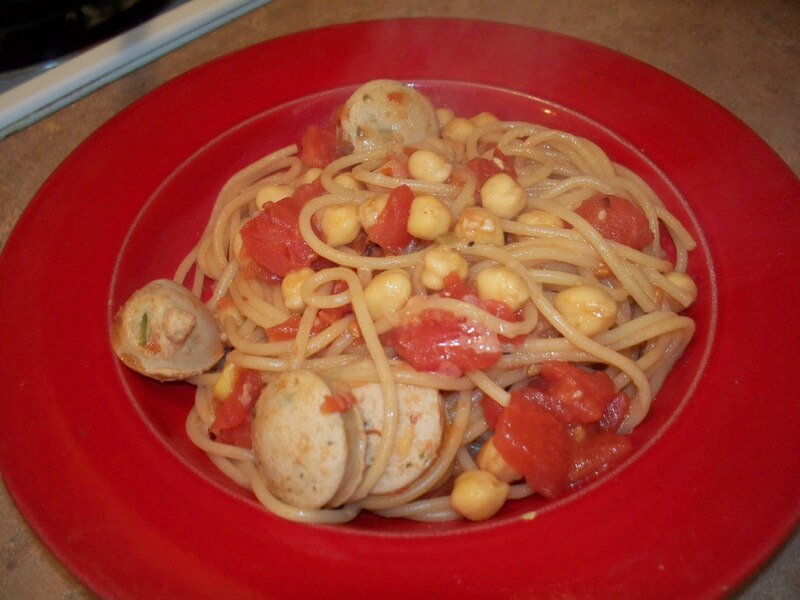 You won’t need to add any liquid or oil as the chickpeas will still have moisture on them from being rinsed. Add salt & pepper to taste and a healthy shake of red pepper flakes. Slice the sausage and add it to the mix. Stir to combine. Pour in 1/4 cup of wine and combine s’more. Add in the pasta (including any remaining chicken broth that hasn’t yet been soaked up. Mix up the pasta and cover with a lid for 2 minutes. We’ll be adding some nutritional info to our recipes. But please remember, we’re cooks, not nutritionists! 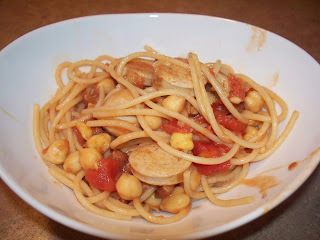 almonds, chickpeas, leah charney, pasta, tomatoes. Bookmark the permalink. Post a comment or leave a trackback: Trackback URL.